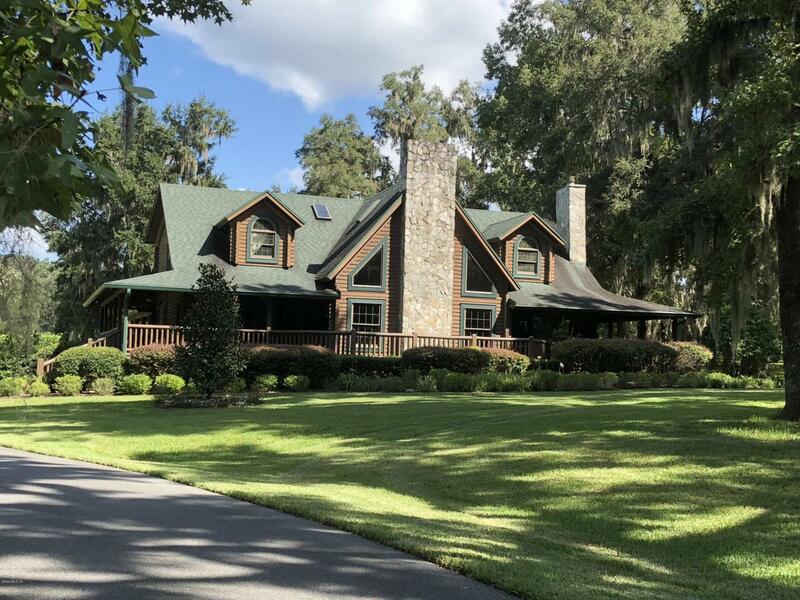 Located in Central NW Ocala, deep in the heart of horse country, is this spectacular 47+/- acre farm. Enter through the beautiful custom gates and meander up the winding drive through gorgeous oak trees to find an extraordinary country home. It is complimented by a perfectly maintained 6, 12x14 stall, center-aisle barn, insulated throughout, with ceiling fans, generous windows in every stall, bathroom, a/c tack room, indoor wash rack, laundry and all other amenities you and your horses desire.If the wrap around porches, stunning chimneys, and an abundance of large windows of this spectacular home don't win you over, just wait until you see what's inside. This home imparts warmth and artful design with huge pillars and beams of tidewater cypress found throughout.The totally new kitchen includes granite countertops, large center island, eating bar, all new stainless steel appliances including a Wolfe gas stovetop, two ovens, and a wine refrigerator. Completing this perfect package is a full home generator, round pen, 2 loading docks, 2 RV hookups, 7 paddocks, and more. There is an additional adjoining 18 acres available with this property that is double fenced with a paved drive and a separate gated entrance. Listing provided courtesy of Linda Doyle of Royal Shell Real Estate.